The so called Scheunenviertel in Berlin Mitte is a neighborhood very well worth seeing, basically located in Berlin’s historic center. The first question that usually arises concerning the Scheunenviertel is “Where is the Scheunenviertel actually located?” – but that question is not so easy to answer. We will come to that later. The other question is of course, why the area is actually called Scheunenviertel? That question is rather easy to answer. Why is the area called Scheunenviertel? If you want to understand the origin of the area, you should probably first have a closer look at the name – and what that name actually means. In German the word “Scheune” basically means “Barn” and “Viertel” means “Quarter” – so “Scheunenviertel” would mean “Barn Quarter” in English. In medieval Berlin, the area used to be located outside the old Berlin City Wall. A rather huge cattle market dominated the area today known as Alexanderplatz. Keeping cattle inside the city walls, people needed a decent supply of food for the animals – so the market had a great demand for hay. Storing the easily inflammable material inside the city walls however was a great risk to the City of Berlin. So the city ordered to build barns for storing the hay outside the City Wall – the original Barn Quarter was built. Where was the original Scheunenviertel located? All streets and buildings of the original Scheunenviertel have actually vanished over time. And since none of the original streets do exist any more, it is a bit difficult to point out, where the Scheunenviertel was located originally. Putting the original Scheunenviertel on a current Berlin map is basically technically close to impossible. Today often the whole area between Friedrichstraße and Karl-Liebknecht-Straße is referred to as Scheunenviertel – bordered by the river Spree and the rails parallel to Dircksenstrasse in the South and the Torstrasse in the North. 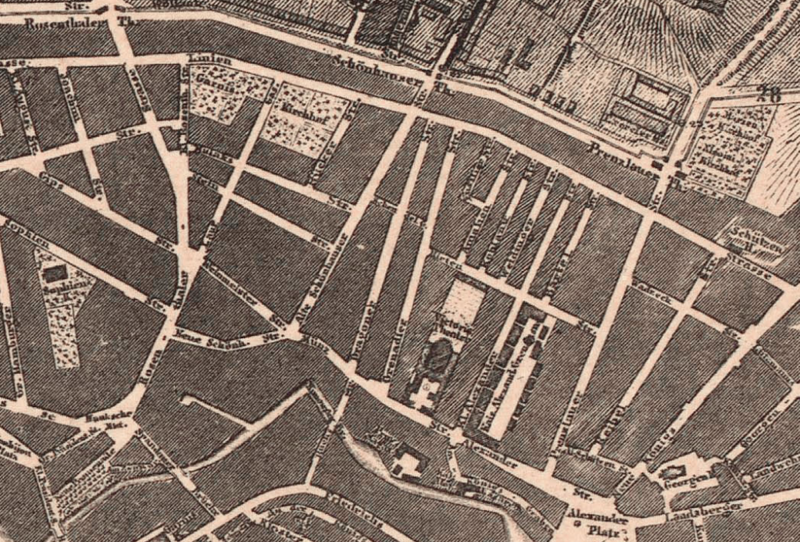 However, the original area, where the original 27 barns were actually built in 1672, was probably much smaller. It is said that the barns were located close to where Rosa-Luxemburg-Platzs is located today – bordered by Almstadtstraße is the West, Hirtenstraße in the South, Linienstraße in the North and Kleinen Alexanderstraße in the East. Over the years the Scheunenviertel has seen good times and bad times – and very bad times. First people that worked at the cattle market moved close to the barns. Some first houses were build – nothing fancy, just rather small buildings to give shelter for the market workers. But Berlin kept growing over the years and more people moved in to that area. When the old City Wall was finally torn down, the barns were then replaced by more houses – but the name of the area remained. In 1737 Friedrich Wilhelm I. gave order that all Berlin Jews, not owning a house, had to move to Scheunenviertel. Additionally Jews were only allowed to access Berlin through either of the two northers Gates. So over the years the area became a Jewish Quarter with its own Synagogues and Cemetaries and Schools etc. Today the area is a nice area for shopping. It is mostly well known for the small shops, boutiques and cafes that you’ll find in the side streets and alleys. But also more and more ‘flagship stores’ are moving in, taking their slice of the neighborhood’s fashion reputation.